This program is the largest of its kind in the nation. The Loveland Chamber of Commerce and the U.S. Postal Service have been teaming up for more than 70 years with their internationally renowned Valentine Re-mailing Program. According to Gwen Masche, daughter of stamp collector and history buff Count Masche, Elmer Ivers, Loveland Postmaster in the 1940s and ‘50s, Harold Dunning, Rome Dietrich and others from the Loveland Stamp Club came up with an idea of a Re-mailing Program as a stamp collection oddity, rather than a Sweetheart angle. The club tried to promote the program for a couple of years but realized they needed someone with more marketing abilities. Ted Thompson, who managed Loveland’s Rialto Theater and served as president of the Loveland Chamber of Commerce in addition to his remarkable marketing skills, was asked to help. Ted realized that Loveland, Colo. had a unique opportunity to share a little love and friendship with the people of the USA, and indeed, the world through the Valentine Re-mailing Program. The program gained nationwide exposure when Guy Lombardo was designated honorary mayor of Loveland on Feb. 14, 1950. Lombardo’s orchestra, The Royal Canadians, had recorded the song, “There’s a Lovely Lake in Loveland” and featured the song during the program. As Forrest S. Knox declared in a letter to the Loveland Daily Reporter-Herald dated Feb. 8, 2001, “They could not have found a better person to shepherd their valentine activity. He and Mabel, even though it was not their idea, were responsible for the success of the Re-mailing Program. They did a superb job of managing the program for the rest of their lives.” Now, in its 73rd year, the program is growing every year. Loveland’s “Valentine Sweethearts,” as they are affectionately referred, Ted and Mabel Thompson have since passed away and the Loveland community feels their absence. 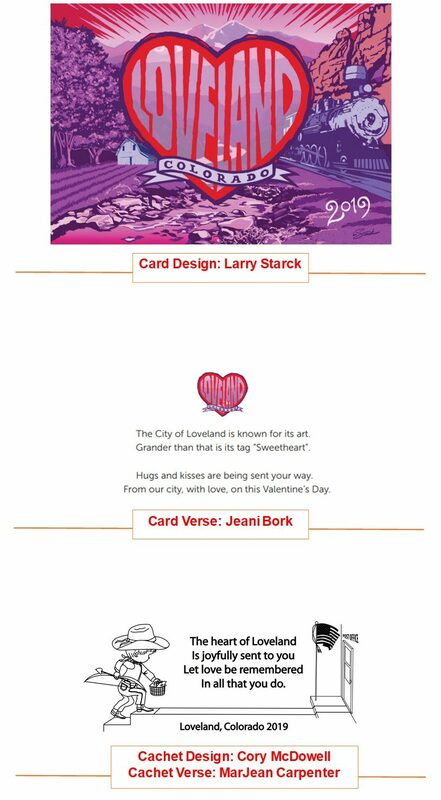 To commemorate their vision and love of Loveland, their memory lives on through this annual program and the people of Loveland. A bronze relief of the Thompsons is featured in Thompson Park in Downtown Loveland. Today, the Loveland Chamber of Commerce continues to operate the program, in partnership with the Loveland post office by creating the special cancellation annually. * Mail for these destinations may be sent after the deadline, but it will not reach the recipient before Valentine's Day. 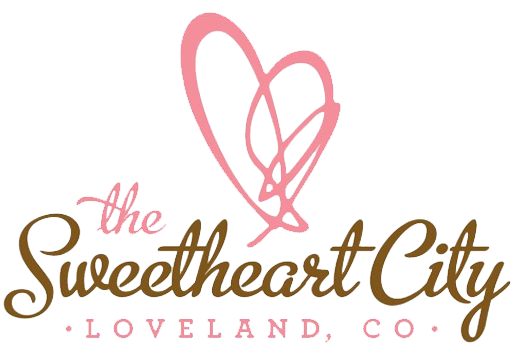 Loveland, Colo., also known as the ‘Sweetheart City,’ has been doing the Valentine Re-Mailing Program for 73 years. Each year, the city and its volunteers lovingly hand stamp and re-mail valentines from all 50 states and more than 110 countries. 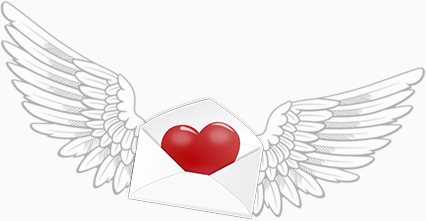 Many of the ‘Sweetheart City’s’ residents are thrilled about the program, so much so that there is a waiting list of volunteers to stamp and re-mail valentines. Loveland’s Re-Mailing Program has grown to be the largest program of its kind. Each year, more than 50 original Valentine volunteer stampers and the one hundred plus that are on the waiting list, come to the chamber building during the first two weeks of February to hand-stamp valentines with a special cachet stamp sent with love from across the globe. Entertainment is provided during the Valentine stamping, by local artist who stop in and sing a tune, which always makes the stampers day special. Visitors from all over stop in to see the magic of stamping and they have a chance to stamp their own valentines, they send to their loved ones. All valentines will be removed from the larger envelope at the post office before they are delivered to our amazing stamping volunteers. These volunteers will add a little extra love to your valentine by stamping the Sweetheart City Cachet stamp and cancellation stamp. Finally, all valentines will be delivered back to the post office and sent with love to the recipient!